Chronicles of a Frugal Gardener: Do these look fake to you? The hubs and I decided that we needed to pull ourselves from the couch on Sunday and get out to the garden and do some harvesting. I headed straight for the 74 tomato plants and he v-lined for the peppers. I don't blame him. The tomatoes are a mess, sagging, droopy, all over the place mess. This is what he harvested. These plastic looking, brightly colored, mild to super hot peppers. My pepper loving 11 year old took a generous bite out of one of the long hot peppers trying to be tough. I think he consumed an entire 1/2 gallon of milk after his tough guy front was knocked over. Needless to say, plastic or not, I'm glad to see a good pepper harvest. Our wet weather prevented this up until this point. Good things are worth waiting for. Speaking of good things. Besides a boat load of tomatoes, I harvested close to 11 lbs of green beans. Holy moly, right! Don't you just love all their colors? I do! Pretty peppers. I'm so jealous that your bells have turned red! My bells are still small puny green ones. They are growing so slow and it's so frustrating. I have some habaneros that are shiny like your peppers too. They do look fake and perfect! 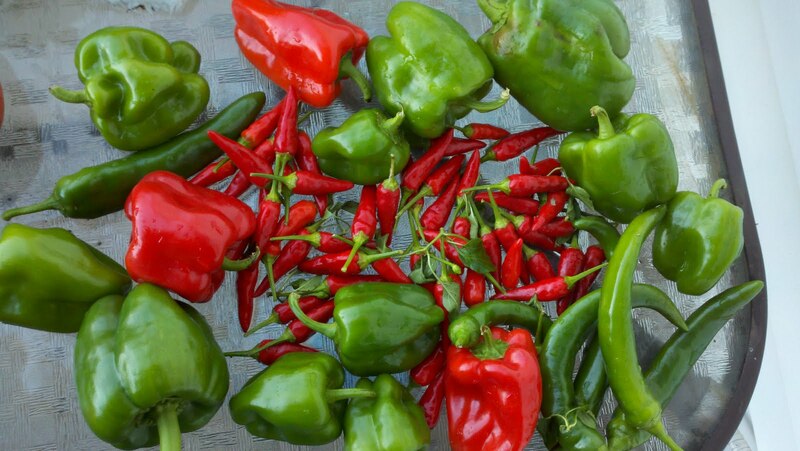 What do you do with all those peppers? Peppers are always so pretty! I love the colors too! Meems, I will cut them up and freeze them for the winter. Some of the hot peppers go into a dill pickle recipe that someone gave me. LOL. 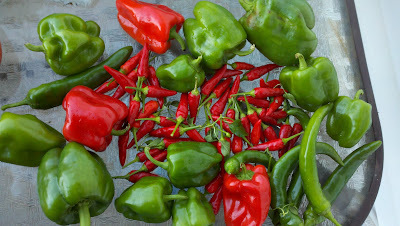 The weather hasn't been good pepper growing weather so maybe next year. @thyme2garden, I read your post and that is hilarious. I wont go near them personally. I know better.